Germany has made a number of unforgettable gifts to modern pop music, from Nena’s mulleted anti-war anthem ‘99 Luftballons’, to the soaring synth tinkle of Alphaville’s ‘Big in Japan’. 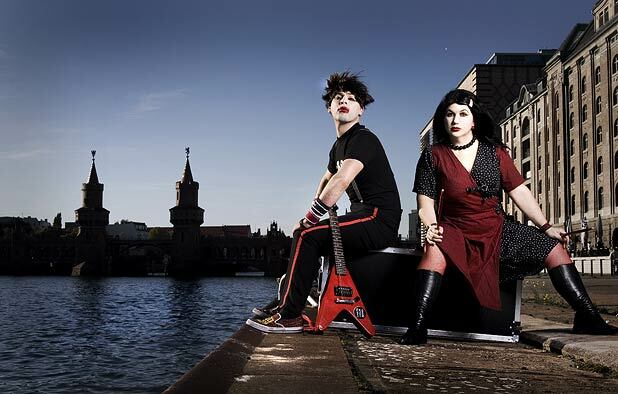 But Die Roten Punkte could be set to eclipse them all with Berlin’s hottest rock band somehow merging the various talents of Beth Ditto, the White Stripes and Marcel Marceau. Otherwise known as Otto and Astrid, Die Roten Punkte started playing music as a form of therapy and a way to make a living when their parents were killed. After that tragic event, an aunt asked them to live with her but the duo ran off to set up home in a Berlin squat. There they would spend their nights sneaking into clubs and their days teaching themselves to play the drums and guitar. ‘Everyone in Berlin is in a band,’ says Otto in heavily broken English. ‘It was a really creative environment. It was just after our parents died. They were killed by lions.’ Astrid interjects: ‘no, no, that isn’t true. Otto was only a little boy, he doesn’t remember what happened. It was my 12th birthday and we were on our way to the zoo and they were killed by a train.’ Whatever the truth in the kooky, colourful world of Die Roten Punkte (The Red Dots), one thing quickly becomes clear: Otto is obsessed with lions. Their current world tour is ‘The Robot-Lion Tour’ and one of their most popular songs is ‘Ich Bin Nicht Ein Roboter (I Am A Lion)’. Another obsession is his guitar. ‘He sleeps with it in his bed,’ mocks Astrid. What do girlfriends make of that? ‘He doesn’t have any,’ she laughs. ‘I do. Online,’ says Otto. Cue bickering. Unusually, Otto gets the last word. ‘I don’t have time for a serious girlfriend. I’m too busy with my music.’ What makes Die Roten Punkte’s success all the more remarkable is that the band isn’t real. Otto and Astrid are actually Daniel Tobias and Clare Bartholomew, two young comedians who have taken North America and their native Australia by storm, scooping a string of awards. Though they were born of the same parents, the two couldn’t be more opposite. Otto is a vegan and a virgin while Astrid is a fun-loving party girl who’s been in rehab with Courtney Love. Onstage, Otto struts and pouts, looking every inch the rock star, while Astrid steals swigs of vodka behind her brother’s back. ‘We are very different and it can be difficult offstage but the music connects us,’ says Otto. Astrid adds: ‘Yeah, even though he’s weird, when we are onstage together it is magic. It really works.’ The pair recently began working on their third album, though they admit it can be hard to stay focussed when they are on the road. Die Roten Punkte, Pleasance Courtyard, The Pleasance, 0131 556 6550, 8–31 Aug (not 17), 11.11pm, £10–£11 £8.50–£9.50). Previews 5–7 Aug, £5. Utterly dysfunctional siblings Otto and Astrid Rot are Berlin pop-punk and electro-clash royalty. Winner, Montreal Fringe. 'Inspired, brilliantly executed lunacy.' - ★★★★★ (Gazette, Montreal). 'Right from a Christopher Guest film.' (Metro, NY).